We check out Bizarre Creations' striking 1080p sequel. Replays via the scoreboard have also failed to make an appearance, but the biggest gripe for the more serious players is the unforced errors the game generates from visually overloading the screen. 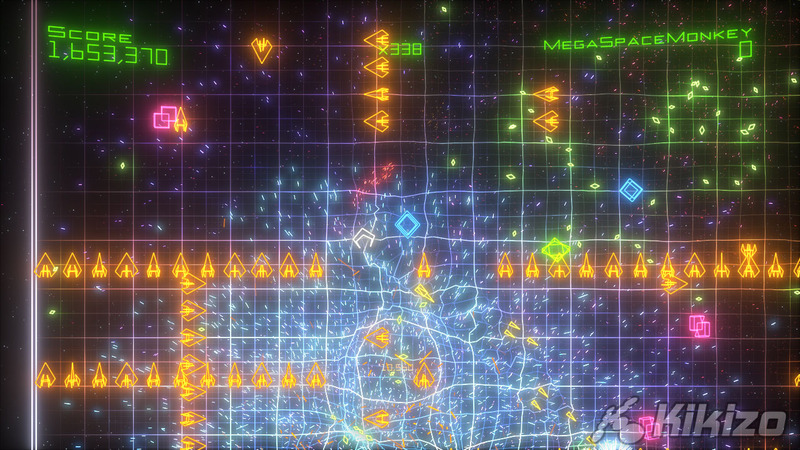 The fact is when Geometry Wars 2 becomes busy it's almost impossible to see certain enemies causing constant untimely deaths, this most apparent with the orange arrows generating on top of snakes and the purple fans which can often be hidden by large explosions. Of course the first game wasn't without its own problems, and many of these have now been seen to, with a more balanced weapons system, easier destruction of black holes and more cunning AI, especially in the form of the snakes and green "things". Enemies spawning on top of the player was also a key issue, and thankfully improvements have been made (providing you keep on the move), but the situation is still not ideal and those pesky orange arrows do still have a tendency for head spawning. Experts will argue that these gripes are relatively small if players are willing to learn basic strategies, the most successful being an anti-clockwise orbit of the screen. Combining this with a calm approach, focusing on the direction of travel to clear a path while firing a few volleys behind, giving a bit of breathing room where possible. 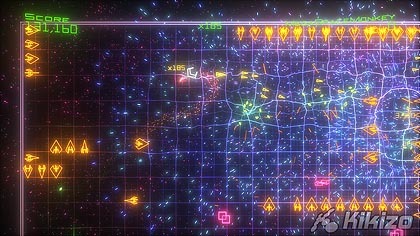 Geometry Wars does take a while to understand as the unique behaviour of the enemies can appear initially random, but repeated play will enable opportunities to herd them and land a well timed bomb to pick up a wealth of multipliers. In the sound department, the original Geometry Wars was somewhat lacking. Evolved came in with a new thumping track, loved by many it went with the action and stood up to the hours of repeated play. 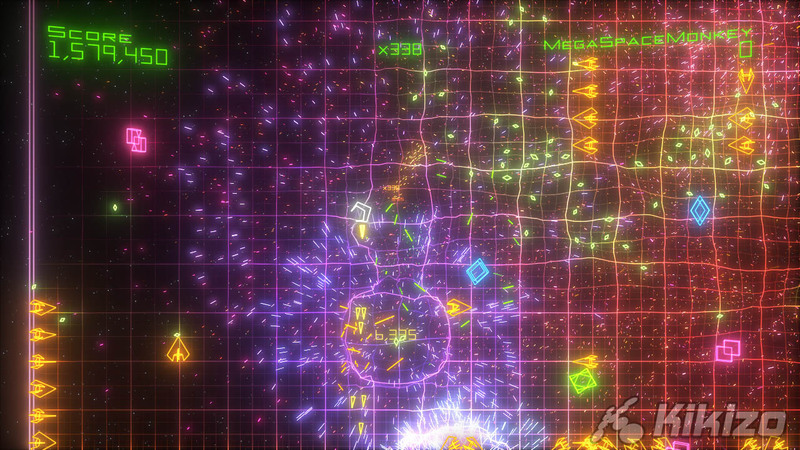 Geometry Wars 2 introduces different music tracks for each mode and includes interactive sound, a feature not often used in real-time gaming but fitting in perfectly to the action. This is demonstrated best within the King and Sequence modes, giving yet more examples of the detail and polish Bizarre Creations has gone to in making this a complete product. Its failing in the lack of online multiplayer is an inescapable disappointment, and for the expert players the over-the-top explosions may make achieving top scores a frustrating experience far too dependent on luck. 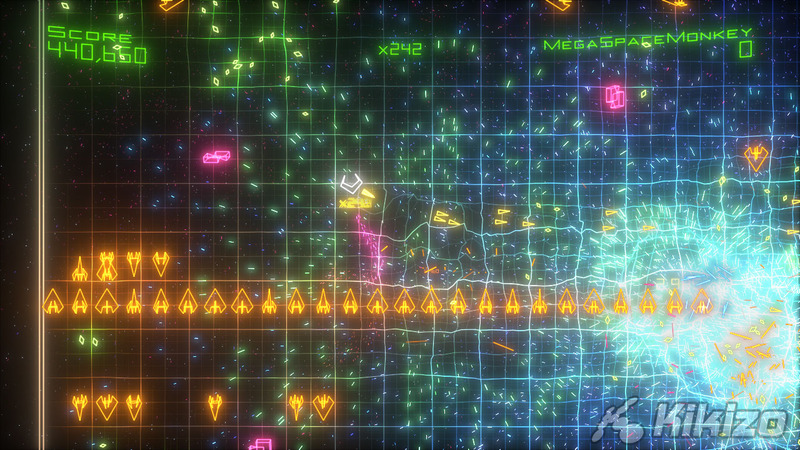 But for the average player Geometry Wars 2 is an unmissable title, and for 800 Microsoft Points it really deserves a place in everyone's Live Arcade collection. 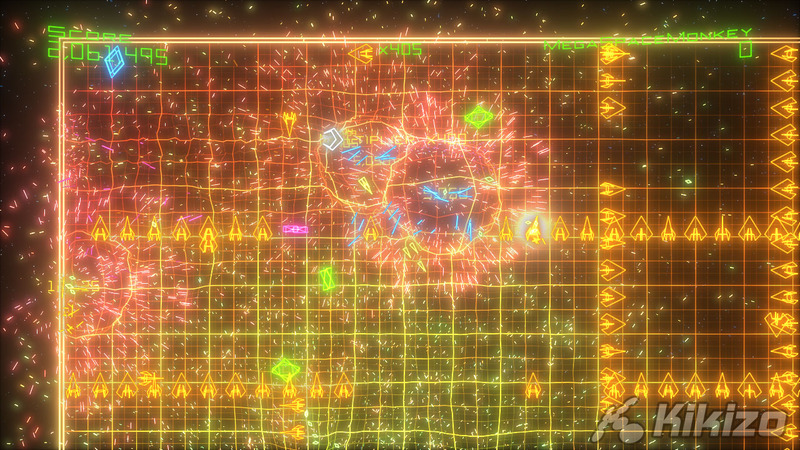 THE VERDICT: Geometry Wars 2 is a better game, not just because of the new modes but the emphasis on fun and novel ways to enjoy an otherwise linear experience.